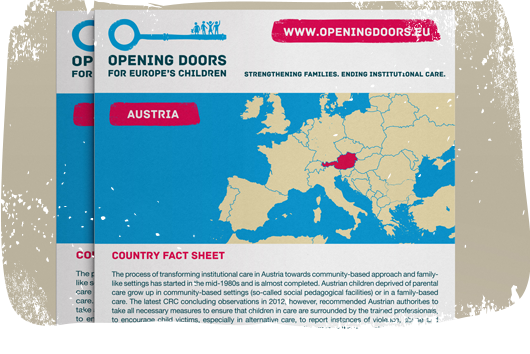 The Opening Doors for Europe’s Children – a pan-European campaign advocating for strengthening families and ending institutional care – has released a new generation of country fact sheets, following the launch of a campaign’s next phase. The latest country snapshots look at the evidence on deinstitutionalisation (DI) and status of care reforms in 15 European countries across EU member states, pre-accession countries and countries within the EU neighbourhood. For 2016 data collection, Austria, Belgium and Spain were targeted as the new national partners in Phase II, in addition to Bosnia and Herzegovina, Bulgaria, Estonia, Greece, Hungary, Latvia, Lithuania, Moldova, Poland, Romania, Serbia, and Ukraine that were focus of the Opening Doors for Europe’s Children Phase I and had earlier 2015 and 2014 versions of the fact sheets produced. The 2016 compilation of data provide recent, comparable and country-specific information on characteristics and the functioning of the child protection and care systems in Europe. It identifies key achievements and gaps towards DI reforms in each participating country focusing on policies that regulate deinstitutionalisation and prevention of child abandonment; engagement of civil society; existing know-hows; access to community-based services, and use of EU funds. The 2016 fact sheets highlight the main reasons for children entering alternative care and detail key challenges to implementing care reforms during the transition from institutional to family- and community-based care in Europe. Tackling child poverty should go hand-in-hand with ending institutional care for children. Opening Doors national coordinators in Romania, Hungary, Bulgaria, Moldova, Latvia and Serbia say that poverty remains the main cause for separating children from their families. Broad public opinion accepts institutional care as a traditional form of care, and leading national NGOs in Ukraine, Bosnia and Herzegovina, and Hungary report increase in the number of children who were placed in institutional care by their biological parents because of poverty. In most of the participating countries, children with disabilities are at the highest risk of being institutionalised due to the lack of support to families and inclusive education in the local area. In Belgium, children with disabilities are among the most discriminated categories that enter public care. In Bosnia-Herzegovina, Greece and Serbia children with disabilities live in the same institutions as adults, and those entering institutions might have to spend their whole lives behind the closed doors as there are no opportunities for independent community living. Investment in prevention and support services at local level, including for vulnerable families or children with disabilities, is lagging behind. Despite the evidence that EU funds are supporting care reforms in Bosnia and Herzegovina, Romania, Bulgaria and Latvia or that the need for DI is acknowledged in most of the countries participating in the campaign, there is more to be done to accelerate the end of institutional care for children in Europe. Our campaign partners have observed that funds are mostly being used to build parallel services rather than investing in ‘soft measures’ such as re-training and training of staff, supporting independent living skills and personalised transition plans, and strengthening existing services in the community. Furthermore, in Belgium and Austria, European Structural and Investment Funds (ESIF) ignores investments in the transition from institutional to community-based care completely, focusing solely on employment measures. In practice, national governments’ plans to reform institutional care systems have often focused on reorganising the existing institutions rather than closing them (e.g. Lithuania, Latvia, Ukraine). In Poland, Hungary, Estonia or Bulgaria, for instance, deinstitutionalisation has meant splitting large residential facilities into smaller units. However, this doesn’t necessarily implied an improvement in the quality of care. Children remain at a greater risk if there is insufficient oversight of the quality of care. There is a general lack of action on institutional care for babies and young children. Although legal provisions exist to prevent children under three being placed in institutions, a lack of alternative care options in practice means children under 3 continue to be placed in institutional care or hospitals in most of participating countries. Civil society remains instrumental and often undertakes the State’s role in developing pioneering services and implementing DI activities in the community due to lack of expertise or funding in the public sector (e.g. foster care training for both parents and professionals, family support and strengthening). Due to the recent influx of unaccompanied refugee and migrant children in Europe, new institutional structures are getting opened to accommodate these children. The 15 country fact sheets in this series were compiled by: FICE Austria, FICE Spain and FEDAIA in Spain, La Port Ouverte in Belgium, Hope and Homes for Children in Bosnia and Herzegovina, Romania, Moldova and Ukraine, National Network for Children in Bulgaria, Igale Lapsele Pere in Estonia, Roots Research Center in Greece, Family Child Youth Association in Hungary, SOS Children’s Villages in Latvia and Lithuania, Child and Family Foundation in Poland and MODS in Serbia. They are updated by the National Coordinators on an annual basis and are primarily sourced from the official state sources. For earlier versions please check 2015 and 2014 factsheets.